But at his party's election headquarters in Tel Aviv, Mr Netanyahu was also celebrating. "It is a night of colossal victory," he said. "I'm very touched that, for the fifth time, the people of Israel have believed in me." "Change is on the way," one activist told me above the roars of celebration. And the real politics start now if there is a close result - as both main parties canvass Israel's president for the right to start talks to assemble a coalition. Mr Netanyahu could overtake Israel's founding father David Ben-Gurion as its longest-serving prime minister if he is re-elected for a fifth term. The 69-year-old has put forward tough messages on security, which is one of the election's key issues. Mr Netanyahu is also facing allegations of corruption which he denies. He says he is a victim of a political "witch hunt" aimed at influencing the election. The Arab alliance, Hadash-Taal, said it was an "illegal" action that sought to intimidate Arabs. Likud said it wanted to ensure only "valid votes" were cast. 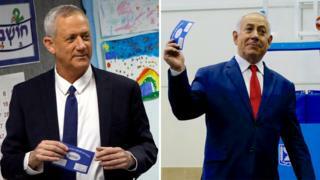 Mr Netanyahu's main challenger, Mr Gantz, is a retired lieutenant-general who formed the Blue and White in February, promising to unite a country that had "lost its way". Mr Gantz's campaign platform refers to "separation" from the Palestinians but does not specifically mention them having an independent state. It also calls for continued control over the Jordan Valley and retaining West Bank settlement blocs. It was not clear how many of the more than 40 smaller parties contesting the election would win at least 3.25% of the national vote - the threshold for entering parliament with four seats. Two exit polls suggested outgoing Education Minister Naftali Bennett's New Right party and Moshe Feiglin's ultra-nationalist Zehut party had not passed the threshold. Who are the key candidates?